When I was young, I remember tuning in with my brother for the Sunday morning cartoons and watching reruns of the Jetson family going about in their flying car. That was the golden era for science fiction. Hollywood was filled with movies like Blade Runner, Back to the Future, Star Wars and The Fifth Element. These movies promised us futuristic worlds full of wonderful tech. It seems like we’ve achieved that future in many ways. Everybody now has a super transmitter in their pocket, allowing them to communicate instantly with anyone else on the planet. We’ve mapped the human genome, made most of the human knowledge freely accessible at one’s fingertips and hell, we’re even making plans to colonize Mars. But despite all of this, one part is missing. There are still no flying cars in sight. They can’t be so hard to make, right? Believe it or not, flying cars have been around for more than 70 years. Ever since Jules Verne introduced the idea in his 1904 Master of the World novel, generations of engineers have tried to make flying cars happen. In 1940, Henry Ford predicted that a combination of airplane and motorcar was coming. At the time, both the car and the plane were becoming cheaper, better and saw massive adoption. A combination of the two was thought to be inevitable. It turns out Ford was right. Just a few years after his announcement, aeronautical engineer Ted Hall came out with the first fully functioning flying car. What you just watched is a 70-year-old video of a fully working flying car. The vehicle was a combination of a road car and attachable wings. It was backed by Convair, a major airplane manufacturer at the time, and had a total of 66 successful test flights. With just a few minor adjustments, it promised to become a huge commercial success. 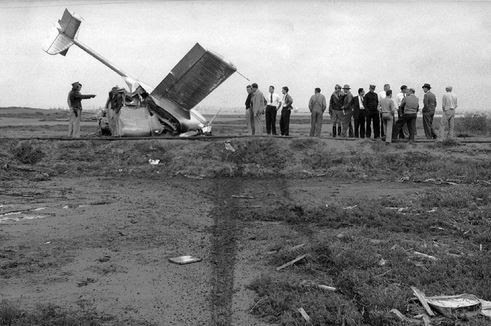 But in 1947, a crash landing during a test flight led Convair to back out. The project, judged to be too dangerous, was eventually shut down, along with Hall’s dream of a flying car in every garage. Since then, there have been countless attempts at building flying cars. None of them made it beyond the prototype phase. 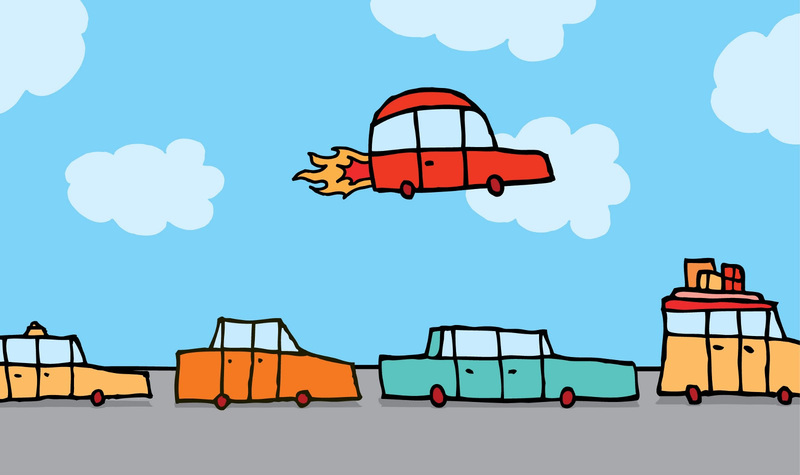 However, what’s most remarkable about the idea of the flying car is how enduring it is. Despite a history of failures and setbacks, every generation of engineers have been, and still are, captivated by the idea. Ultimately, the reason we don’t have flying cars isn’t technological or cost limitations. Today, companies like Terrafugia, AeroMobil and Moller International are actively pushing the dream forward. 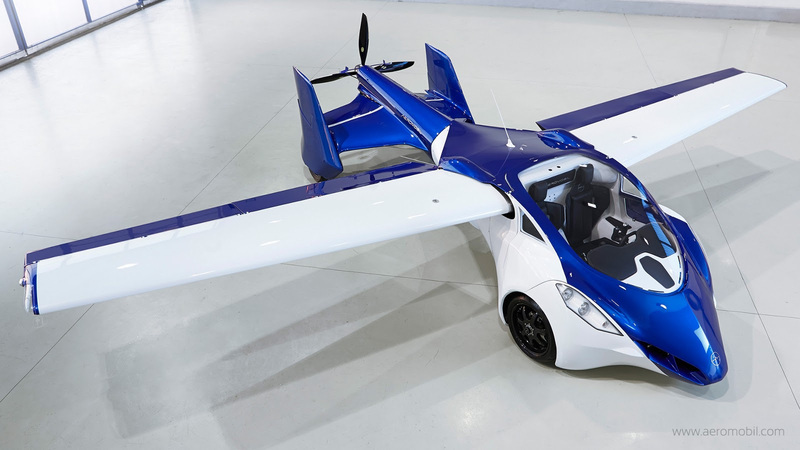 You probably have never heard of them, but all of these companies have actual, workingflying car prototypes. As we’ve seen, the technology for flying cars has been around for decades, and even today, companies are working on them. So why are there still no flying cars in sight? As I covered before, humans are horrible drivers. In the U.S., cars cause about 30,000 deaths per year, costing $871 billion dollars in the process. Think of the worst driver you know. Now imagine that person flying a two-ton death machine. How would that make you feel? Public adoption of flying cars would be a death warrant for every single building in the world. 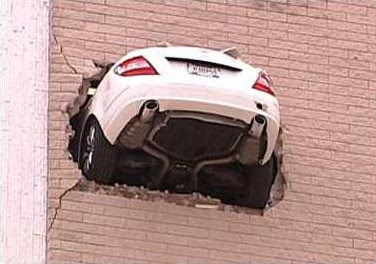 Modern buildings have been designed to sustain normal car crashes (which happen all the time), but not flying ones. In the air, a mere collision with another car could send both vehicles crashing to the ground. Who would want to live in a world where flying metal can fall on your head at any time? Ultimately, the reason we don’t have flying cars isn’t technological or cost limitations. It’s because most human beings are way too unreliable to fly anything. This is where it gets interesting: We’ve already solved the problem of unreliable human beings with self-driving cars. Self-driving cars are real. All of the biggest tech companies are working on them, and it is only a matter of time until we see Google-like cars everywhere. While self-driving cars are neat, they are not nearly as fascinating as their potential successor: self-flying cars. “How can a computer be smart enough to fly a vehicle?” you might ask. It turns out, it is much easier to build driverless tech for flying vehicles than regular cars. In the air, there are no pedestrians, potholes, construction sites or any other obstacles that give computers a headache. This is why driverless tech has been first developed for airplanes and has now been used in airfare for decades. Recent advances in sensors, computing and AI are making human pilots almost unnecessary. Today, pilots fly, on average, between 3.5 and 7 minutes per flight. While pilots’ income used to compare to lawyers and doctors, the entry salary for new pilots in the U.S. can now go as low as $10.75 per hour. There has been a lot of talk about how automation is taking out taxi and truck driving jobs. Pilots are no exception. To sum things up, safety is the main issue with flying cars, and driverless tech is the key to solving that problem. So, who is working on that? In the last years, three major players in the Valley have raised strong interest in flying vehicles. All of them are currently working on driverless technology. Oh, and they also have very deep pockets, access to the best engineers in the world and a history of making seemingly impossible ideas happen. 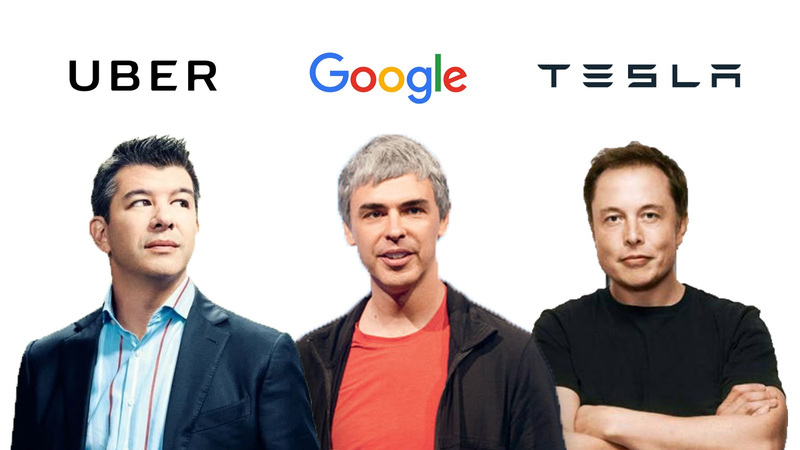 They are Travis Kalanick, Larry Page and Elon Musk. Last month, Uber published a 98-page white paper explaining their vision for our flying-car future. The paper, summarized here, describes a concrete plan to expand their business toward a global, shared, on-demand aviation service within the next 10 years. In short: Picture the Uber app, but for driverless, flying vehicles. Beyond Uber, Larry Page also has a big interest in flying cars. In the past years, he has secretly invested more than a $100 million in two flying car startups, Zee.Aero and Kitty Hawk. Zee.Aero is currently testing its prototype at the Hollister Municipal Airport, where people have reported seeing weird vehicles taking off and landing. Kitty Hawk is a bit more secretive, but interestingly enough, it is run by Sebastian Thrun, the former head of Google’s self-driving car program. Picture the Uber app, but for driverless, flying vehicles. As for Musk, well, he doesn’t quite believe in the idea of a flying car. Not because they would be too hard to make, mind you, but because he thinks there are more efficient ways of traveling between cities, such as the Hyperloop. However, for long distance travel, he thinks that electric aircraft are the way to go. In several interviews, he mentioned that his next big idea is a supersonic electric jet. In fact, he already has a design, and if no one else does it, he might start yet another company to make it happen. What’s interesting about these projects is that they have one point in common: their design. Indeed, Uber, Page and Musk’s projects are about electric, human-carrying vehicles that can take off and land vertically. That last part is important. You could argue that the flying cars shown so far are, at best, an awkward and overly expensive combination of a plane and a car — the resulting vehicle being much worse than the sum of its parts. This is because planes and cars are meant for very different purposes, and merging the two means making terrible compromises. Ultimately, you would be better off buying a plane and a car separately. To solve this design problem, we first need to let go of the idea that a flying car should look like a plane or a car. I’ve covered how we have the bad tendency to apply old solutions to new technology, and why ground-breaking products usually require a new design approach. This is exactly what we’re getting with VTOLs. VTOLs stands for Vertical Take Off and Landing vehicles. In short, the same technology that made possible today’s drone revolution will enable our future, human-carrying flying cars. Forget wings and wheels; we’re talking about the Jetson type of flying car. Picture DJI’s drones, but for people. The EHang 184, unveiled at CES 2016, is among the most exciting prototypes. If driverless tech was the key to making flying cars safe, drone tech is the key to making them simple and ready for mass production. Beyond looking silly, strapping plane wings to a car is a flawed idea in many ways. Wings mean the vehicle has to take off horizontally, which is dangerous, cumbersome and requires a lot of space. By switching to vertical thrusters, the vehicle can achieve a high altitude much faster, which saves a lot of energy. With such a design, you can strip the vehicle of its most dangerous, movables parts, such as the wings, the tail and elevators. The resulting design is simpler, safer and easier to mass produce. We need to let go of the idea that a flying car should look like a plane or a car. Another key part of the design is the electric motor. Beyond this being great for the environment, electricity is the most logical option for VTOLs. Because they don’t require as many moving parts, electric motors are much easier to produce than combustion engines. They are also way more energy-efficient, easier to maintain, less likely to break down mid-flight and can’t explode in case of impact. Electric motors also enable having multiple asynchronized thrusters. If one thruster fails, the others can instantly adjust to compensate and land safely. Finally, electricity has the huge benefit of being silent. This is a big distinguishing factor between VTOLs and helicopters. In their paper, Uber estimates that, during take-off, the VTOL’s noise will be comparable to the city’s background noise. During flight, it should be barely audible. Who has ever dreamed about, while being stuck in traffic, pressing a big red button, soaring up in the air and flying over all the other suckers? Eliminating traffic is the dream and the promise of flying cars. As I mentioned before, traffic his a huge burden for our society. In the U.S. alone, traffic wastes about $124 billion annually. One of the biggest causes of traffic is the lack of infrastructure. Our highways were never designed to sustain today’s amount of commuters. With VTOLs, that won’t be a problem anymore. Their mainstream adoption would massively reduce the need for roads, rails, bridges and tunnels. In addition to being great news for the environment, this would mean hundreds of billions of dollars in potential infrastructure savings. Furthermore, not being bound to infrastructure also means saving a lot of time. Trains, buses and cars can only go from A to B in limited and sometimes inefficient ways. Roads are constantly exposed to interruptions, such as car crashes or construction work. Flying, on the other hand, means being able to travel in a straight line, which is the shortest distance between you and your destination. In addition, being able to take off and land vertically is a huge advantage over current aircraft because you aren’t dependent on airports and runways anymore. Just take off near home, and land next to your destination. Again, less infrastructure required, more time saved. In its paper, Uber estimates long-distance commute as the best initial use-case for VTOLS. Ultimately, with mass production, they believe VTOLs could be cheaper than owning a car. 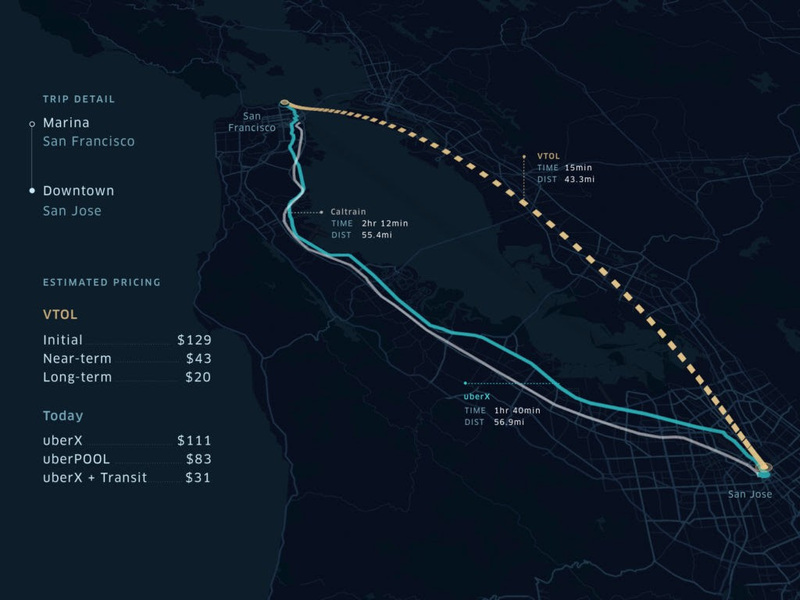 For example, a 2-hour 12-minute drive from San Francisco to San Jose could eventually be a 15-minute, $20 ride in a VTOL. Pretty good. Flying cars still have a long way to go. In its white paper, Uber underlines the major challenges needed to make them a reality. 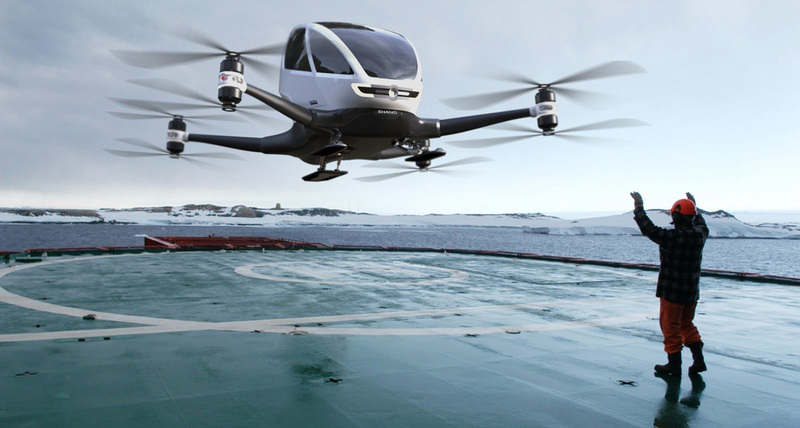 For starters, even if they don’t require any pilots, new flying vehicles need to comply with FAA regulations, which will likely take a long time. Furthermore, there are still concerns about costs and safety, and the battery technology isn’t quite there yet. In its white paper, Uber presents how it plans to address those concerns and achieve public adoption of VTOLs within the next 10 years. In From Zero to One, Peter Thiel presents the controversial idea that we don’t live in an innovative world anymore. He argues that, while the industrial revolution saw massive innovations such as electricity, home appliances, skyscrapers, cars, airplanes, etc., today’s innovation is mostly confined to IT and communication. As Thiel puts it, our smartphones distract us from the fact that our lifestyle has remained strangely unchanged since the 1950s. I would propose that is not the case anymore. At least, not in transportation. Recent projects such as the self-driving car, the Hyperloop and reusable rockets prove that innovation is alive and well. And now, on-demand shared flying cars promise to democratize air travel the same way the car once democratized ground transportation. Ultimately, this means better, faster, cheaper, safer and environmentally friendlier mobility for all. Flying cars might still have a long road ahead of them, but it doesn’t matter. Because Marty, where we’re going, we don’t need roads.